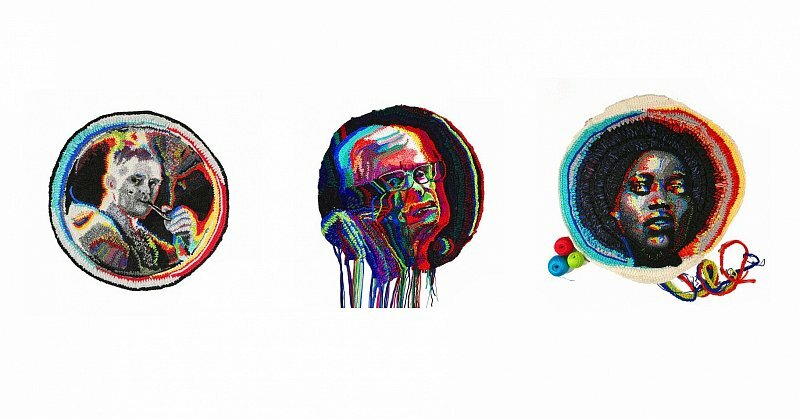 This 'RGB' triptych is within the framework of a project titled 'Glitch'. By combining her new technique of crocheting distorted, polarized images, with a round, somewhat old-fashioned round shape, reminiscent of grannies’ crochet rags and napkins, the artist achieves a stark stylistic contrast. By adding her signature loose threads to the overall neat shapes, the artist empathizes one of her favorite themes of connections, piercing through the Universe, be it ties of human interactions or strings of the String theory. The audience is invited to find connections among these seemingly unrelated subjects of the triptych portraits, to ponder how they relate to or complement one another.